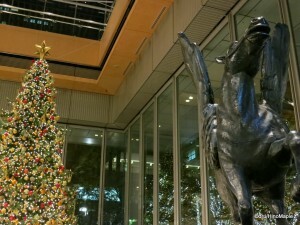 Marunouchi is one of the famous places for Christmas and this year it will continue that tradition. Unfortunately there really isn’t anything special about it. 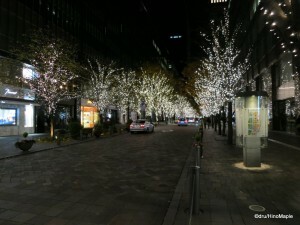 People rave about how Naka-dori, the main shopping strip in Marunouchi, is lit up. In fact, it was lit up before any other area in Tokyo. The bad part is that they use only white lights, which makes it look great, but after seeing just one block, it all looks the same. Then there is the Red Brick Square which is a small hidden square located between Yurakucho Station and Tokyo Station on Naka-dori. It is a nice little square that continues the white light theme but at least they have a nice Christmas tree inside. If you don’t want to see a small Christmas tree in an outdoor plaza, you should just stick with the large tree inside the Marunouchi Building. In their main atrium, they have a huge Christmas tree on display as well as a small display celebrating the 60th anniversary of the nearby Shiki Theatre. They have a display showing a few costumes and sets from the Tokyo production of Phantom of the Opera. It is pretty nice but really busy when they are open. While it is a bit early to visit Marunouchi, the main show will start on December 21 when the new Tokyo Michiterasu starts. Tokyo Michiterasu will be very short lived as it will end on December 28th, so go there quickly or you will miss it. Hopefully I’ll have time to visit Tokyo Station during the show and I’ll post photos and perhaps video as well. This entry was posted in Christmas, Tokyo and tagged Christmas, Christmas Illumination, Christmas Lights, Christmas Tree, japan, Maru Biru, Marubiru, Marunouchi, Marunouchi Building, Michiterasu, Naka-dori, Phantom of the Opera, Shiki Theatre, tokyo, Tokyo Michiterasu, Tokyo Station by Dru. Bookmark the permalink. So … Michiterasu replaces the old Lightopia? I found a site (link below) that talks about a “tessellation light show”. It sounds as if that might replace the beautiful paper lanterns they always had near the fountains (with messages from school kids). Pity. The paper lanterns were always my favourite part. Incidentally, don’t you love the illustrations on this website? Winter Xmas illuminations, and the people are dressed in summer clothes. Yeah, right. I don’t know if they still have the lanterns at Wadakura. No info yet, and I haven’t had a chance to try and check it out. Just too far and too cold to go there at night. If I find out they do, you know I’ll tell you. Did you get to see the Michiterasu light show? I happened to be there on the first day (December 21) of the Tokyo Hikari Vision show. I also got a video of the event recorded: http://www.youtube.com/watch?v=OwWTpEmhJVc. There are some minor distractions in the video but overall it was alright, especially after considering that the show was cancelled partly on December 23 and completely on later days due to excess crowd! Unfortunately, no. It was cancelled on the second night and hasn’t been turned on since. I did get to see the lights though. They were nice and since there was no video show, it wasn’t too busy. Oh well, I’ll try to check out your video soon. Work duties mean I don’t have too much time, but I’ll do my best. Thanks for the link!